So, next week there is a presidential election in Egypt. I think it should have quotation marks. Bare minimum, I predict El Sisi will win at least 85% of the vote. Get ready for a landslide. In U.S. history, we have had some lopsided results ourselves: Reagan over Mondale and Carter, Nixon over McGovern, Johnson over Goldwater, Eisenhower over Stevenson. And in Azerbaijan where I recently visited, the most recent presidential election results were accidentally released before election day! The third-term incumbent eventually won with 87%. Yes, there are many landslides, around the world, throughout time, in varying context. But this landslide is rolling right over Tahrir Square and into my heart. So I’m going to write about it. My take is personal, not political. I am not a journalist or political analyst. El Sisi, I feel he is a good man. A smart leader. I hope that what he, the military and the interment government have allowed these past 11 months (Rabaa, mass trials, mass death sentences, bogus arrests and prison terms, a yes-or-yes referendum, militarization of the public sphere and extensive curfew, home and university invasions, protest law, attacks on journalists and activists, and divisive labeling of citizen terrorists) is not indicative of this soon-to-be presidency. I hope there isn’t a complete unbalance of power, like we had with Morsi. I hope Egypt under the ElSisi administration develops the social justice and the freedom, simultaneously as the bread. I hope ElSisi’s term encourages agency, engagement and education, development of strong opposition parties and candidates, and creative vision. An application of the values and the good that came from the waves or revolution and awakening. My fear is that this presidency could eat away at all that. My fear is that it will feed the senses of entitlement and righteousness, the class divisions, and bring back the fear and dependency. If ElSisi is a successful president, I hope he is not seen as the hero nor the provider. I hope that Egyptians remember just a couple years ago when community policing was honored and bombs were not a part of the story. I hope this presidency encourages young people and women to become leaders in their fields and their communities. I hope the Governers and Ministers are productive, effective, open minded, and innovative. Supported to try new things. In a more decentralized way. I hope those local leaders are diverse: women, young people, Coptics, former Muslim Brotherhood members or supporters, Sunni and Shia, Sudanese and Syrian refugees, African and Arab immigrants, rich, poor, middle class. I hope all leaders serve those they represent, securlarly. Without bias, corruption, classism, seniority, sexism or racism. I hope Sadat Station is re-opened. I know I hope for much. Bottom line, I hope my Egyptian activist and artist friends can set a standard where their revolution continues in this direction. They have worked nonstop for years. I see that fact in their eyes and shoulders. I hope they can push this coming landslide into a tide of progress. Not just for the gasoline and electricity, for the menial jobs, for the safety and security. Remember, there were three tiers for the revolution. You might think it odd, but I hope this election is messy. Not violent or deadly, no not like that. Just messy, raw. Where citizens and artists take their place at the table, without waiting for the invitation. Where one man isn’t handed the keys of the city. 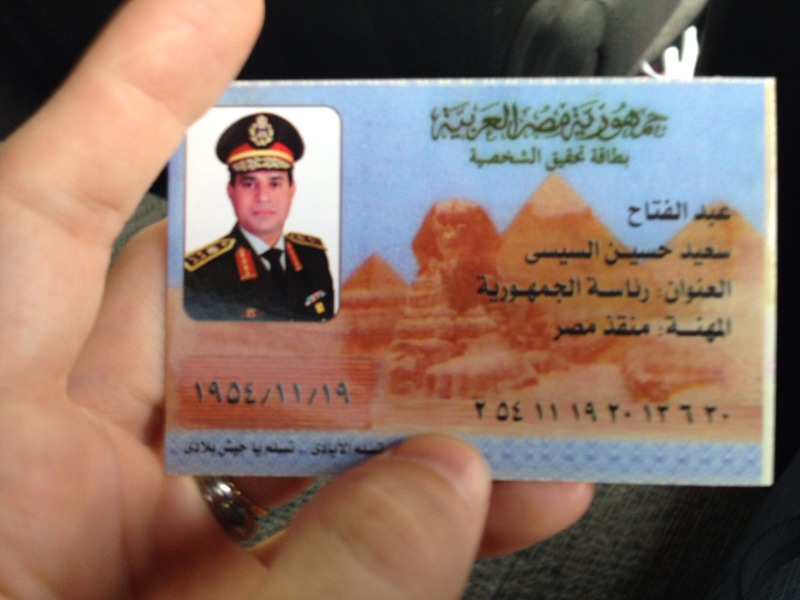 A group of young men and women in white ElSisi t-shirts just reached in the window of our cab to make sure we had these. 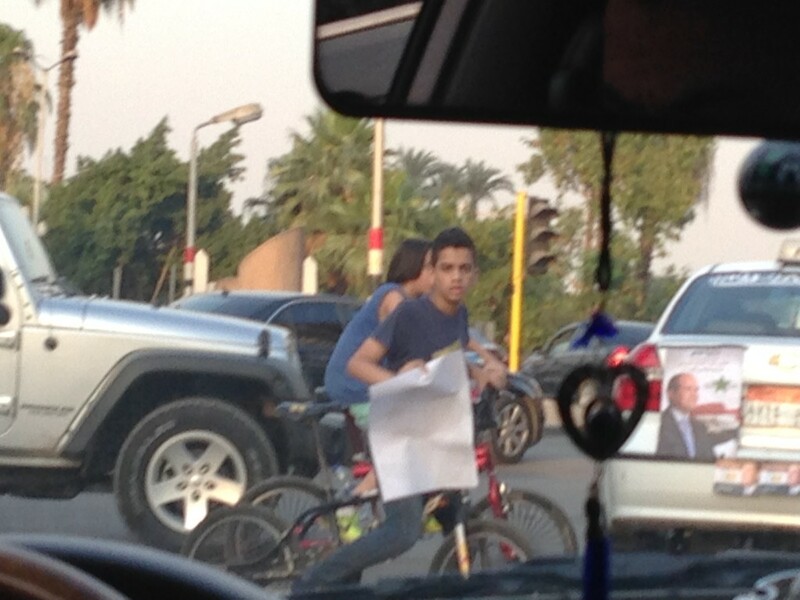 There was a also a group of younger kids on bikes circling with ElSisi posters. In my estimation, there are posters of ElSisi on more than 50% of the lampposts and billboards. 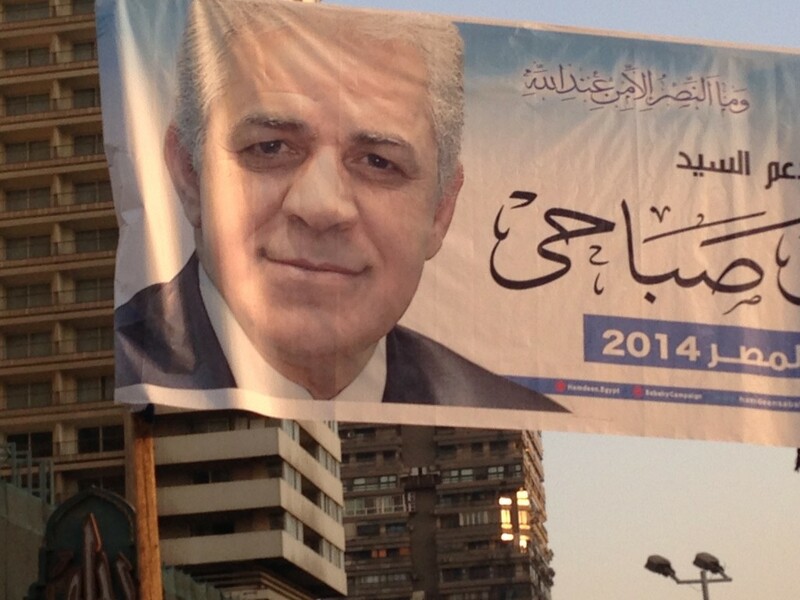 But this weekend I am now seeing many more posters for the other candidate, Hamdeen Sabahi. I hear that most of ElSisi posters, videos, and other publicity are paid for and created solely by his supporters. His campaign has had to do little work.